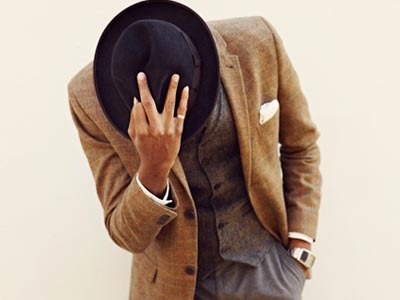 Londoner La Touché, aka Mr. Hat, is on a mission to make the head accessory popular again. Multi-talented fashion designer Mike Sylla grew up in Senegal, but has lived and worked in Paris for more than two decades. He started Baifall Dream, his clothing line in 1990 - and its uniquely raw and edgy hand painted leather creations have received wide acclaim. London-born Punk rock singer and songwriter Ebony Bones is known for flamboyant style. In this interview this discusses her influences and her Caribbean roots. UK-based designer Walé Adeyemi has achieved more than most designers. He'll soon be entering his 19th year in the fashion business and has worked with some of the world's top stars. Professional model and actress Menaye Donkor lives in Europe but her heart and caring eyes are focused on her numerous needy "children" in her home country, Ghana. Go behind the scenes at Amsterdam stylist Diana Tambe Blackpearl's Secret Fashion at The Voice Achievers Awards 2012. The Holland-based top model from Cameroon is also an up and coming young designer and CEO of Africa Fashion Week Holland. Based in Cologne Germany , Haitian-born Michelle Elie is a jewelry designer and former model whose style is getting her noticed by fashionistas around the world. African Woman.NL is a lifestyle publication for women in the Netherlands. It is a brainchild of Cameroonian researcher and novelist Barbara Tah Gwanmesia, who says she wants to rebrand the image of Africans in the country. Milan-based street photographer and fashionista Tamu McPherson shows how to throw a dinner party in this installment of Tamu's Cafe. Rihanna reveals the inspiration for her designs for River Island and why she loves British high street fashion. New York-born, Paris-based stylist Peju Famojure has a passion for fashion that is earning her a growing reputation in the European fashion centre. UK-raised architect David Ajaye is said to be American President Barack Obama's favorite architect, but his work has impressed many others around the world. French designer Mason Ewing may be blind, but it has not stopped him from pursuing his dreams of becoming a star. A legendary supermodel during the 70s and 80s, who graced the runway of every fashion capitol, Romney Müller-Westernhagen has turned her talent to photography. See calendar for details of her Berlin exhibition. Ayishat Akanbi is a young talented British celebrity stylist who has clients such as UK music producer Labrinth, and the X-Factor. In this interview she talks about the ins and outs of her career. Obed Osei Amoah Duku, is the youngest Ghanaian entrepreneur in Italy. Obed, 24, who lives in Brescia, owns a consultancy firm and runs a charity organisation. London-based Ghanaian stylist Marian Kihogo has been hailed as a top stylist/consultant/celebrity dresser/online phenomenon. Her online blog is also winning her fans outside of the fashion world. Meet the new girl: Nyasha Natonhodze is a good Christian girl, just like her grandmother taught her. VIDEO & TEXT: Chef's Creole treats charm U.S.
French owner/chef at La Table de Babette in Paris, Babette de Rozieres was not just the only female chef in the French contingent, but also the only person of color on a recent visit of French chefs to the U.S.
Ethiopian-Swedish chef Chef Marcus Samuelsson shares his journey of opening his restaurant, "Red Rooster" in New York's Harlem. South African-born, Belgian-based stylist Pholoso Selebogo may be young, but she is already the darling of the fashion world. She is working with top designers and traveling the globe. Born in Guadeloupe, Clarisse Hieraix graduated from France's prestigious "chambre syndicale" school 15 years ago. She is now established in Paris' ultra-chic Golden Triangle. Meet UK Chef Barrington Douglas, an award-winning chef whose Huddersfield, north of England Caribbean restaurant is helping to put the islands on the culinary map. Anais Mali was born in Nice, France to a Malian father and Polish mother. Now the young model is looking for stardom on the other side of the Atlantic. Find out about her journey in this video. An interview with French model and actress Noemie Lenoir about her clothing line and launching a new perfume named after her with fab Afro-French make-up line Black Up. Born in Senegal, Rougui Dia has become a well-known chef in France, where she commands the kitchen at the restaurant owned by venerable caviar house Petrossian and mixes traditional African cuisine with European flavours. Swedish born Sabina Karlsson began her career as a skinny model before becoming a plus size one. In this interview the 2006 runner up in Scandinavia's Next Top Model discusses the transition and her discovery that bigger means better for her. Meet Senegalese/French model Aminata Niara a star on Paris' runways. Discovered by fashion designer Alber Elbaz in 2006, she has since worked for some of the world's top designers. 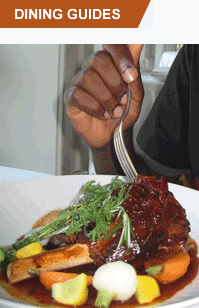 Jamaican-born Brit celebrity chef Levi Roots knows how to cook that's for sure. Famous for his Reggae Reggae Sauce, he's working on some mouth-watering spiced mackerel with green bananas in this episode of his cooking show Caribbean Food Made Easy. Charismatic Ghanaian-born Savile Row designer, Ozwald Boateng, has outfitted men like Will Smith, Richard Branson, and Brad Pitt. This documentary called A Man's Story details his rise to fame. View a clip here. Yelena Khanga is one of Russia's best-known black citizens. The popular host of a top-rated 1990s chat show -- "Pro Eto," (About That) -- she became one of the few black faces regularly seen on Russian television. Jamaican-born Wilfred Emmanuel-Jones is a country farmer in rural UK who is not just building a food empire but is also making a name for himself in politics. Meet the Black Farmer. British Formula One racing superstar Lewis Hamilton is at the top of the motor racing world. Meet the 12-year-old Hamilton in this excerpt from a documentary made about his pioneering achievements. Spotted in London's Topshop at 17 and currently signed to "Profile Model Management," British model Tolula Adeyemi has worked with a bevy of top photographers and designers, and appeared in "British Vogue," "Vanity Fair" and more.